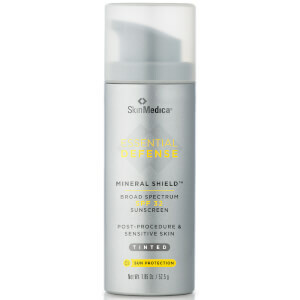 Lightweight, sheer, and cosmetically elegant all physical broad spectrum UVA/UVB protection. Gentle enough for sensitive, post-procedure skin types with age defying ingredients that moisturize and improve the skin’s texture and tone. Inactive ingredients: Water, Cyclopentasiloxane, Dimethicone, Polyglyceryl-3 Polydimethylsiloxyethyl Dimethicone, Butylene Glycol, Aluminum Hydroxide, Caffeine, Camellia Oleifera Leaf Extract, Sodium Citrate, Sodium Chloride, Dimethicone/Vinyl Dimethicone Crosspolymer, Dimethicone/PEG-10/15 Crosspolymer, PEG-9 Polydimethylsiloxyethyl Dimethicone, Triethoxysilylethyl Polydimethylsiloxyethyl Hexyl Dimethicone, Stearic Acid, Ethylhexylglycerin, Phenoxyethanol. I've been using this for awhile and continue to return to it when I occasionally try other face SPF products. It goes on easily, is absorbed quickly, is effective, and it doesn't leave a white film that I've experienced with other products. I've gifted it to my daughter who lives in North Carolina, and she loves it, too. I like the matte feel once the sunblock dries. It comes out of the tube white and goes on my skin looking light, but it seems to go clear as it dries. This sunblock dries pretty quickly so I don't have to wait a long time before putting my makeup on.